Life right now is a bit tensed and hectic. In between all the work, hospital visits and attending to the needs of my family I hardly am getting any time to sit with the laptop. For which, could not even publish the generous comments some of you have given on my posts. The sonny boy is home for his summer vacation and his innocent blabbering helps to uplift our mood occasionally. Right now no one is home except the baby and me and though I feel tired and exhausted but cant close my eyes and drift away to sleep. So just thought of doing something that I love. This is a very old post from my draft. Made this cake for my elder brother’s birthday last year. He is mad about fresh cream black forest gateau and absolutely loved this cake. It completely went out of my head and was sitting pretty in the draft folder for almost a year. its high time that I post it before I prepare his cake again next week. 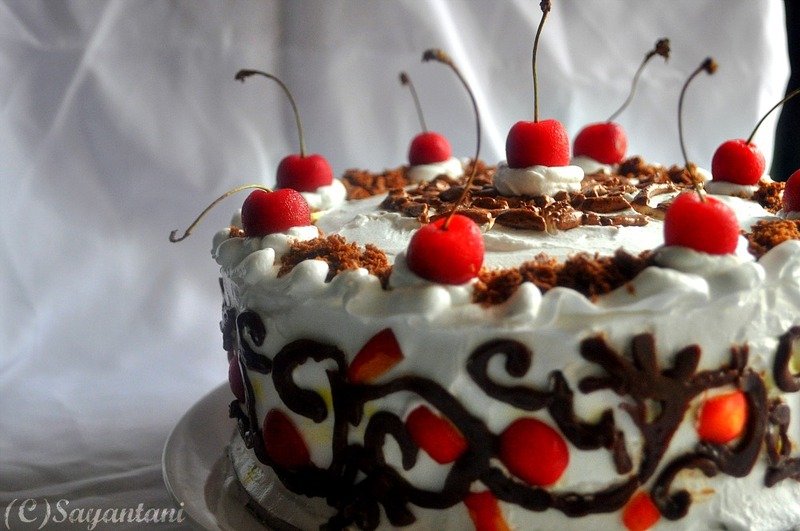 I already have a black forest recipe from my initial days of blogging. This one is more authentic as now I know that a black forest should always be made with a sponge cake. 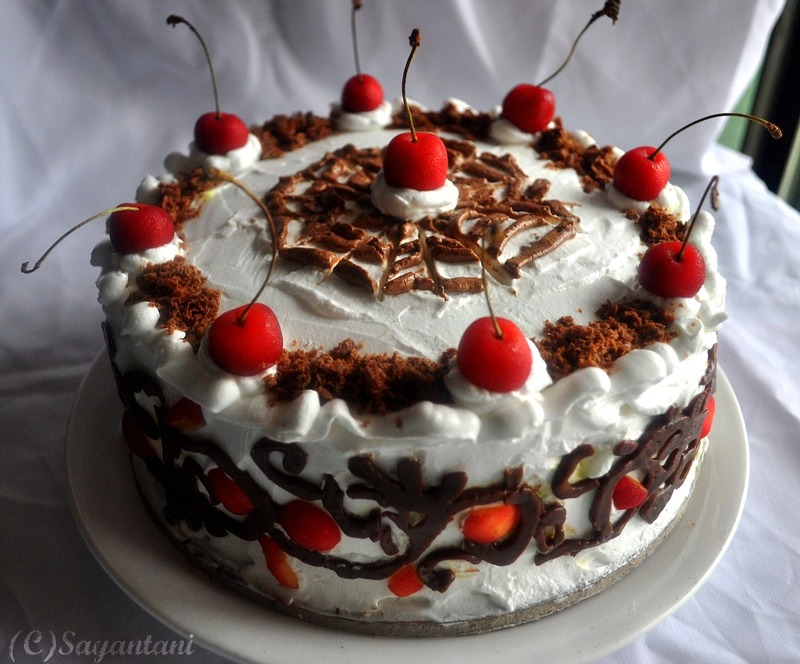 I have been making this cake for last 2 years or more as every Bangali seems to love a big piece of black forest gateau. And almost every other person in my friends circle thinks that black forest cannot be made at home. so whenever I offer them a cake for their birthdays they seem to feel like challenging my skills with this cake. I have made it so many times that now am bored and wanna dig in other territories of cake making. Cake decoration is another field that I want to explore. I love to decorate cakes and cookies but with the unavailability of most of the products that becomes a little difficult. Mostly the cakes that I decorate are very simple and use products that are available here. above is the first cake that I decorated with marie biscuit dough, it tasted delicious but colouring the dough was a wee bit difficult. Decorate with piped cream, shaved chocolates and fresh or frozen cherries. Always chill the cake for 3-4 hours before serving. This helps the flavours to maturate and the decorations to set. 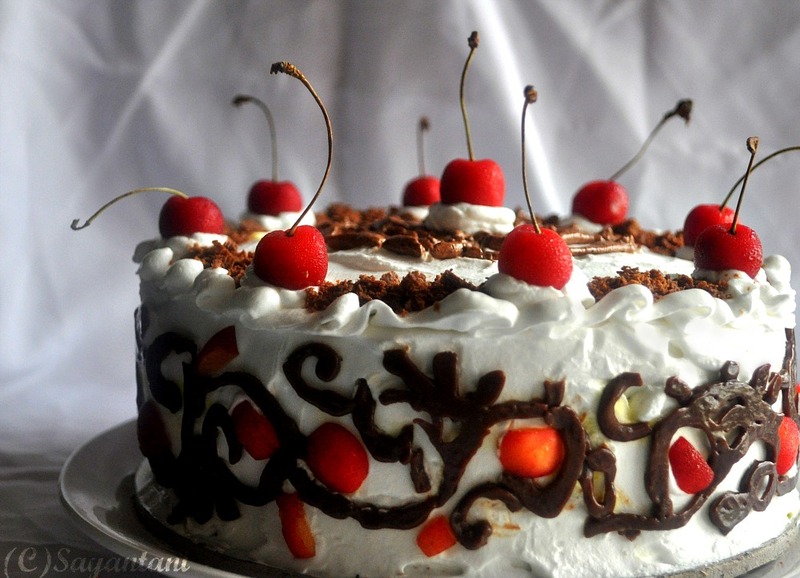 Chilled black forest is a joy for the taste buds. Try to cut even layers as this helps the cake to be steady. for perfect even layers measure the height of the cake after leveling the top. divide by the number of layers you want in the final cake. take a ruler, mark the layer height at 3-4 places. take a big serrated knife and cut. Always cut a cake that is completely cold. Dipping the knife in warm water helps in getting neater layers. Always handle the cut layers with utmost care. The fat-less sponge is very delicate and crumbly and breaks easily. Do not try to cut very thin layers until you are very confident of your skills. With this recipe its easy to make 3 layers. Do not over beat the cream as it might curdle. Vardhini's Bake Fest: June'12 Issue this month hosted at Daily Cuppa. 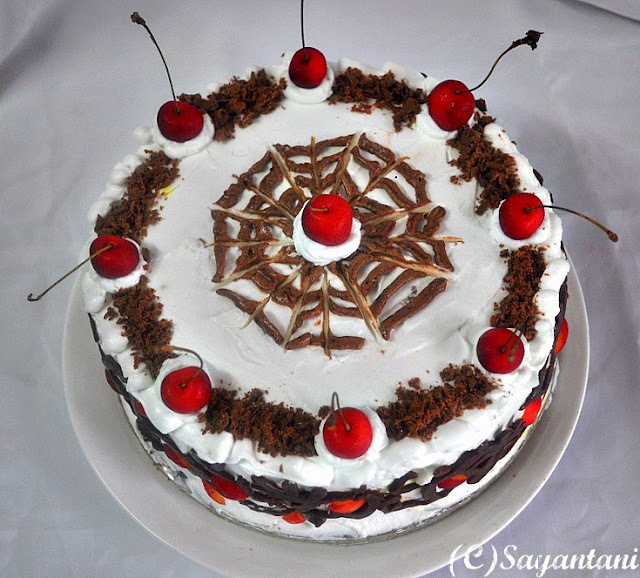 Favourite cake recipes at Zesty South Indian Kitchen. 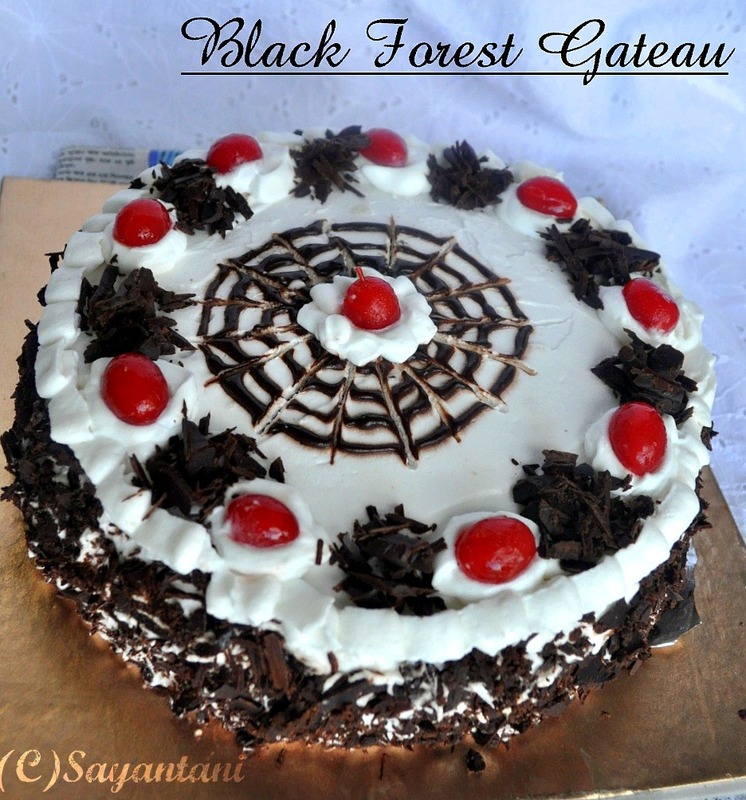 This black forest cake is really beautiful. I was amazed with limited availability of baking supplies, you are doing very beautiful cakes. am very tempted to try out this cake now..beautifully explained and your cake looks awesome..
tumi plz ekta culinary show koro TV te.. atleast zee bangla rannaghore jao.. people should know your talent..
Lovely cake and the decorations look good. I would not even dare to try the design you made without proper stencils. So kudos for the amazing cakes. 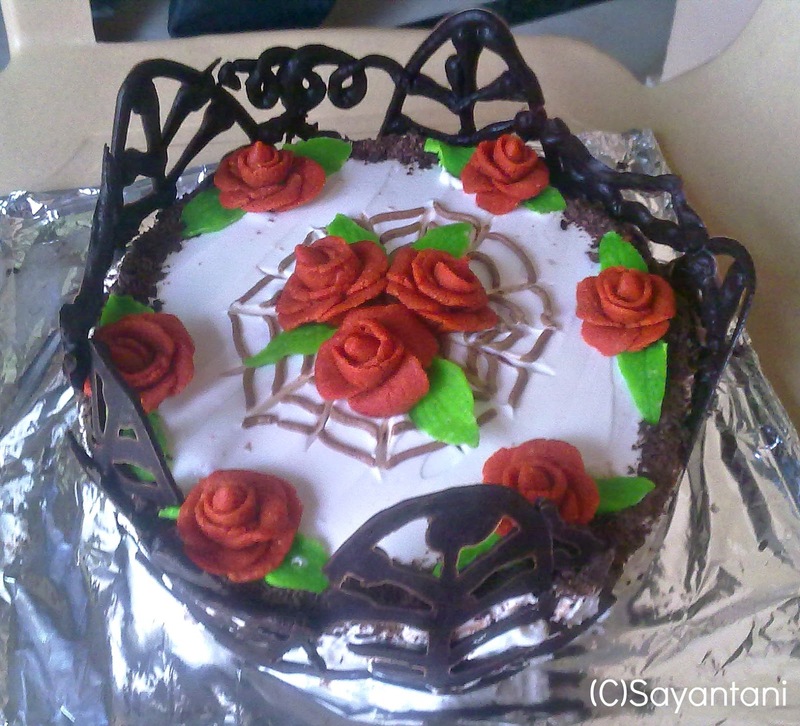 Sayantani, the cake looks amazing. Hope things improve and you start feeling better. Take care! Wow Sayantani..all the cakes are looking gorgeous..somehow I never decorated any cake, pretty scared actually. Really admirable how well you have decorated these, and hope you are doing fine. This is awesome... black forest has been one of my favourite cakes and I had so many bookmarked recipes of it biut now that I turned vegan I'm looking for susbstitutes but I can always bake it for my family. I too love to decorate cakes but it is the unavailability of the baking and decorating supplies that hampers the passion for decoration. I love that you used marie biscuit dough for decorating. i would love to try that, I'm sure it would taste better than fondant, which I've tried making at home and I just find it tooo sweet. That's awesome and professional...Yummo yum Sayantani. Wow! you made this super cake. I walk to the local bakery and buy it!! Shame! The cake looks fantastic and yum yum :))Happy to follow ur blog. 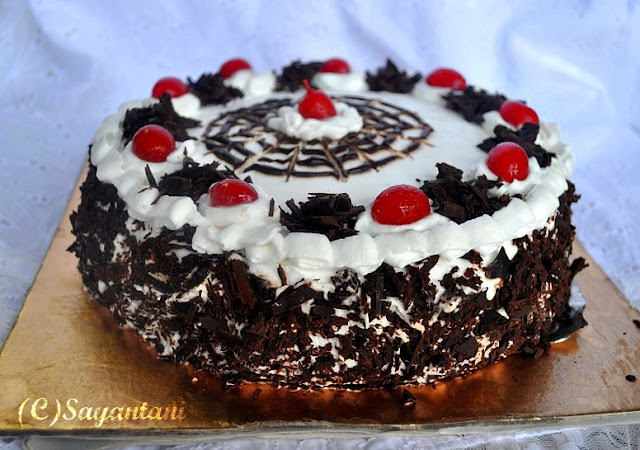 Mindblowing,super tempting and irresistible cake..
Black forest cake looks superb. Really tempted to make one soon. Black forest cake looks so beautiful and Delicious..Awesome Sayantani..
wow ma favourite cake.. .. This is outstanding dear.. really awesome and perfect:) fanastic decoration.. very glad to be ur follower... do visit and join my space in ur free time. Fantastic work, all these cakes look so professional & perfect! Gosh! You are so talented! Hi dear. How are you feeling now? You must have gone through terrible pain and look here, who is baking such amazing cake and frosting it too..I guess a good way to distract yourself. But on a serious note, take due rest too. hi sayantani... lovely cake.. i love the way you have decorated it.... saw teh jungle cake too... hats off to you.. i know when u say u dont get teh stuff in India..
lbut still u did a wonderrrfffulll job! !